My best friend and the GCG mascot: Cubby the Munchkin Cat from Mars. Believe it or not, Cubby was surrendered to San Francisco Animal Control. I thought it was odd to find a purebreed there but then I came to find out he was given up due to the illness of his guardian. When I was there one morning doing my daily intake for the SF/SPCA, I spotted him and fell head over heels. Cubby is one interesting fellow. He can stand upright (as pictured above) for minutes at a time. His short Munchkin legs give him a very unique sense of balance, not to mention a very awkward and clumsy play style. 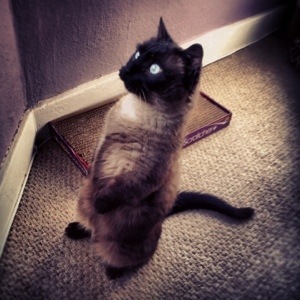 Add to that…the atypical Siamese breed traits and you have what I can only describe as a Munchkin cat from Mars. Cubby is not without his “behavior concerns”. He is diagnosed with Feline Hyperesthesia, which causes him to “chase ghosts”, running about the house as if his own tail is chasing him, eyes dilated and skin rolling across his back. He will even resort to self-mutilation and chew his own tail base. Thanks to Prozac, Cubby rarely has an episode these days, but it is quite surprising to see sometimes. It’s almost like he’s in a trance. Like most cats, Cubby has a threshold that varies. He loves to be held and will stay in your arms for long periods of time, but is also very clear when he has had enough. The standard head turn, “love bite” or licking will precede a final warning. In my house, we never get to that point. Cubby stays comfortable in his surroundings because his boundaries and eccentricities are respected. We found out the hard way that one of his boundaries was … NO OTHER CATS!! Cubby refuses to share his people with that of another feline. Like most people in San Francisco, I live in a tiny apartment with just enough space for us and him. We remedy that problem by providing Cubby with vertical climbing structures and cat shelves that get him off the floor and high up where he can be king of Mars. Cubby exemplifies the Go, Cat, Go Motto. Slow down. Live in the moment. Be patient with the process.